If you are using this product at home, learn all preparation and usage instructions from your health care professional. Before using, check this product visually for particles or discoloration. If either is present, do not use the liquid. If you are mixing this solution with another medication, ask your doctor or pharmacist if it is proper to mix it with the medication. Learn how to store and discard medical supplies safely. Redness, pain, or swelling at the injection site may occur. If any of these effects persist or worsen, tell your doctor or pharmacist promptly. Tell your doctor right away if you have any serious side effects, including: swelling hands/ankles/feet, trouble breathing, muscle cramps/weakness. Before using this product, tell your doctor or pharmacist if you have any allergies. This product may contain inactive ingredients, which can cause allergic reactions or other problems. Talk to your pharmacist for more details. Before using this product, tell your doctor or pharmacist your medical history, especially of: kidney problems, heart problems (such as heart failure), body water/salt imbalance. This solution is safe to use during pregnancy or while breastfeeding when used as directed. Laboratory and/or medical tests (such as blood tests, kidney function) may be performed periodically to monitor your progress or check for side effects. Consult your doctor for more details. For the best possible benefit, it is important to receive each scheduled dose of this product as directed. If you miss a dose or if your dose is interrupted or stopped, contact your doctor right away to establish a new dosing schedule. 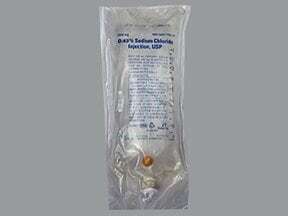 Are you taking Sodium Chloride 0.45 % Intravenous Solution? 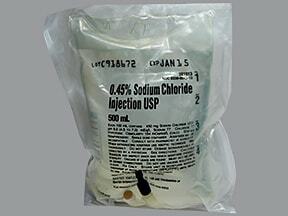 Are you considering switching to Sodium Chloride 0.45 % Intravenous Solution? How long have you been taking Sodium Chloride 0.45 % Intravenous Solution?